Formulated with 100% BioOrganic botanicals, this evidence-based range has proven that nature can be scientific, and that you can achieve remarkable results without a single chemical. Aurelia Probiotic Skincare was named ‘Best New Brand’ by the Ultimate Natural Beauty Bible, and the best-loved Miracle Cleanser has scooped up a coveted ‘Beauty Bible’ award, as well as being highly commended in Tatler’s 2014 beauty awards. With an uplifting blend of eucalyptus oil (to decongest), chamomile (to soothe), rosemary (to invigorate and fortify) and bergamot (to help relieve stress), this gentle cream cleanser eliminates dirt, oils and dead skin cells (when buffed away with the accompanying bamboo muslin cloth) to leave skin clear, glowing and perfectly prepped for Aurelia serum or moisturiser. And like all things Aurelia, this is completely free from synthetic fragrances, parabens, mineral oils, silicones, sulphates, propylene glycol, phthalates, GMO, PEGs, TEA and DEA – and is certified ‘Cruelty Free’. 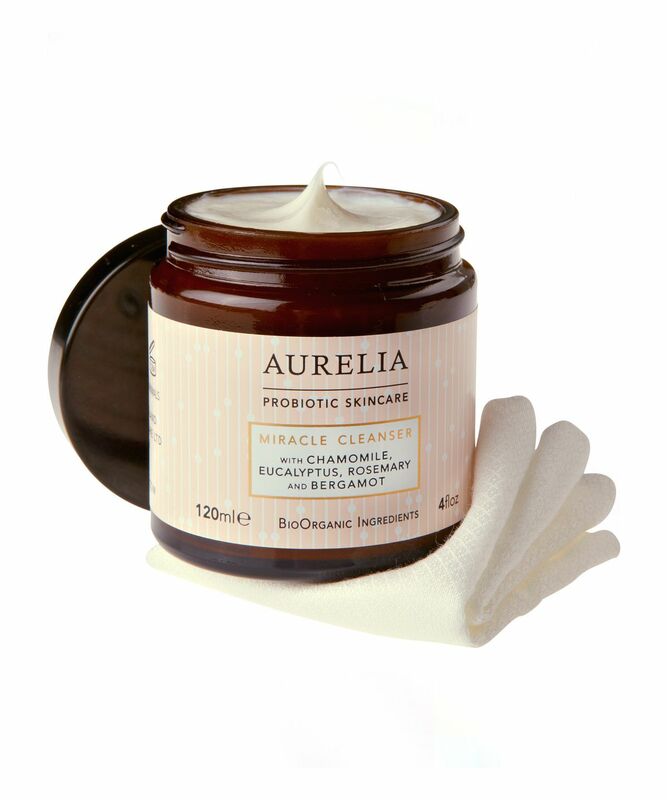 Fusing probiotic and peptide technologies, with a cocktail of BioOrganic plant and flower essences, Aurelia Probiotic Skincare’s Miracle Cleanser is an aromatic, creamy cleansing infusion – which effortlessly melts every trace of make up and grime to leave skin feeling beautifully clean, soft and dewy. Aurelia’s signature probiotic technology uses specific, ‘immune modulatory’ glycoproteins – cell surface molecules which enable cells to ‘talk’ to one another - to generate targeted impulses in the skin; balancing stress-damaged tissue whilst stabilising its defences. By bolstering skin’s protective barrier, Aurelia Probiotic Skincare helps to ward against free radical attack and encourage cell metabolism – maintaining DNA integrity and counteracting the harmful effects of UV exposure, so skin stays strong, supple and luminous. To achieve ultimate daily results follow our indulgent two-step process. Step one: Apply the creamy cleanser to dry skin, massage deeply with fingertips to lift daily grime and make-up away from the skin and stimulate circulation. Step two: Remove cleanser with Aurelia’s antibacterial bamboo muslin to gently exfoliate and reveal a bright, clean and glowing complexion. Ensure the cloth is warm and damp and gently sweep over the skin. Pat dry and follow with Aurelia’s Revitalise & Glow Serum. Aurelia’s antibacterial bamboo muslin is also supplied. I really wish this were not so expensive because it's AMAZING. It's so gentle but removes makeup really well. I have very dry and sensitive skin and this cleanser is the only thing I've ever found that actually gets it clean without leaving me red and sore. Now I just need to win the lottery. I didn't think this cleanser will perform much but it's one of the most soothing, luxe cream cleansers that make me look forward to take off my makeup at the end of the day. Obviously meant for a 2nd cleanse, it's gentle yet leaves my skin soft. I don't normally leave reviews because I often don't have much to say about my beauty products, until I tried this cleanser. I have oily combination and sensitive skin and I travel a lot - so my skin isn't in great shape. I have been searching for a cleanser that deep cleans but also moisturises and this is it. I love the scent, how my skin is plump and glows after each cleanse and how I feel it really cleans my skin. I double cleanse in the evenings. My only concern is that I go through 1 pot every 6 weeks. The larger size is great but you often can't get the last bit of cleanser out of the bottle. I used this product together with the other Aurelia products and it cleanses my skin very well, it supports my natural skin barrier because of that probiotics, but I wouldn't say that this is the best cleanser ever, only very good! I didn't like the scent of eucalyptus because I am pregnant. This is gorgeous. Smells beautiful and my skin loves it. Rich but not heavy. The face flannel feels good to use and not abrasive. I've sensitive and reactive skin but this is ok. Washes off well and my face feels comfortable after I use it. This is a lovely soft balm. Texture does not require rubbing. My prefered use is in the morning because the cent is so incredibly uplifting but also relaxing. Good for your mood!! Love it. I use it as a second cleanse in the evening. It does cleanse my skin, but that is just about it. I need quite a lot for a good massage, so it doesn't last long. Otherwise it just seems to sink in quite fast and then I don't even feel cleansed. i bought a full set with the cleanser, serum, day and night cream. Of all these products, the Miracle Cleanser is the best product. The eucalyptus smells so soothing and relaxing. It is so calming for sensitive dry skin. The packaging came with muslin cloth, I was concerned that the cloth would be to hash when I rub the cleanser off my face, but it was not; the muslin cloth were very soft and weaved fabric of good quality. This cleanser is so lovely to use. The smell itself is really uplifting and a real treat to use morning and night. The creamy texture feels wonderful on the skin and melts away all grime and makeup. My only critique would be its packaging as i feel it would be better and more hygienic in a squeeze tube. For me it does sting my eyes so I wouldn't recommend it for taking off eye makeup, but still great for removing all other face makeup. A real gem. Smooth this thick cream onto your face, cover with a hot muslin cloth and breathe deeply... leaves my skin feeling moisturised and clean. I love using this in the morning to wake me up with the lovely essential oils. Works best in winter for me. Love that it has no nasties. Worth a purchase. A Must have, even for male skin ! I've been an Emma Hardy cleanser user for the last few years, but when I saw this, fuelled by being pregnant & my love of natural skincare I thought I'd give it a try. This is now my no.1! It's great for my dry skin. Smells amazing & gives my skin a lovely glow after using. Highly recommended! The Aurelia starter packs are a great way of trying the range out too. Got this a sample. I'm working my way through high-end cleansers/skin products as part of a New Year's splurge to try and find a favourite one and it's this one. Much better than I thought it would be. Goes on beautifully, lovely to use. I love balm/oil cleansers too, but on balance I think it's cream cleansers I prefer the most and there aren't lots of those compared to balms. I think the Aurelia range is really lovely and its brand I will purchase once my splurge is over and bank balance has recovered. My products so far are going to be ; Cleanser - Aurelia Exfoliater - Omorovicza Facial Polish Facial Oil - Drunk Elephant Marula Oil Daily Moisturiser - Caudalie Revesterol Cream. This works really nicely I think. I use it as apart of my "second evening cleanse" as well as in the morning. It smells a bit medicinal (perhaps it's the eucalyptus--thus it reminds me a little of Vic's vapor rub) but with a warm cloth, it feels very soothing on the face. I think it has also helped with my hormonal acne! I would recommend but I'm not sure if I will buy again due to the price. This is such a beautiful cleanser. It makes my skin so so soft !! It doesn't remove waterproof makeup up, but for everyday light makeup it works great ! LOVE IT ! Absolutely love this for my dry-ish skin. Use it as a second cleanse (too good & pricey for my first cleanse) and it just leaves my skin both super clean and lovely soft. Will be re-purchasing forever! My skin feels so, so soft - like baby skin! Love it! With all the raving reviews I thought it'd be perfect for me to try when I received it with a purchase. But it really dried my skin out, to the point the tightness meant every time I moved my face I could feel the skin stretch. Over the next few days it developed to actual flaking of the skin. So it just wasn't worth the hassle for me. Creamy and rich, not heavy. I really like how this cleanser feels after using, my skin still feels so good. Unfortunately it does remove makeup, not very effective for taking off eye makeup but I use it mostly on the face. The jar is maybe not the best packaging for me, especially for travel. The scent is very strange (herbal) to my nose. It’s so hard not to fall in love with this pretty cream cleanser at first sight. The thick cream, almost moisturizer-like, comes in a elegant-style jar and a bamboo cloth for a luxuriously warm wipe. With ingredients like rosemary and eucalyptus, it’s packed with goodness and smells very nice. Not cheap, but well worth the splurge. Not only does it leave the skin clean soft and glowing, it also magically cures minor headaches and stuffy sinuses. Just massage it on to the face and then hold a warm Muslin over it while inhaling deeply. Best pick me up ever! I absolutely love this cleanser. I wear heavy makeup sometimes and I used Eve Lom before, which I believe is the best cleanser. Then I discovered Aurelia. It's cheaper, isn't oily and does the job. I definitely recommend. Btw, it works great with Eve Lom muslin cloth.